Our relationship to our possessions -- few topics are more timely for today's blessed Christians . . . or more neglected. Yet author Gene Getz tells readers that the Bible says more about the things we own than any other subject except the Godhead. His thorough exploration of biblical history reveals overarching "supraprinciples" of ownership that apply to all people everywhere, then and now. Getz shows how Christians can resist the deadly tendency towards selfishness inherent in today's culture and how to use their possessions as effective tools for witness and spiritual growth. 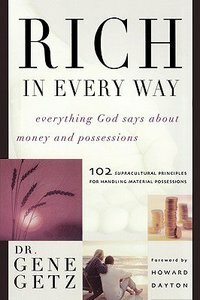 Avoiding both the extreme of "selling all and giving to the poor" and the greed-centered "prosperity gospel," he explains the "biblical" attitude toward possessions: a releasing of "this is mine" view of our possessions and allowing God's gifts to flow through our hands to meet human needs, demonstrating His love to an unbelieving world. - Publisher Dr. Gene Getz, a graduate of Moody Bible Institute, has been involved in a variety of experiences, including Christian education, music ministries, and college and seminary teaching. He has authored more than fifty books and has directly or indirectly helped launched seventeen churches in the Dallas metroplex. Currently, Gene serves as a senior pastor of Fellowship Bible Church North in Plano, Texas; director of the Center for Church Renewal; host of Renewal Radio; and adjunct professor at Dallas Theological Seminary. About "Rich in Every Way"
Dr. Gene Getz, a graduate of Moody Bible Institute, has been involved in a variety of experiences, including Christian education, music ministries, and college and seminary teaching. He has authored more than fifty books and has directly or indirectly helped launched seventeen churches in the Dallas metroplex. Currently, Gene serves as a senior pastor of Fellowship Bible Church North in Plano, Texas; director of the Center for Church Renewal; host of Renewal Radio; and adjunct professor at Dallas Theological Seminary.